Photo and recipe from Allrecipes.com. This recipe serves 16. 1. Preheat oven to 350 degrees F (175 degrees C). Mix together the pretzels, 4 1/2 tablespoons sugar and melted butter. Press into the bottom of a 9×13 inch pan. Bake for 10 minutes, or until lightly toasted. Set aside to cool completely. 2. In a medium bowl, beat the sugar and cream cheese until smooth. Fold in whipped topping. Spread evenly over the cooled crust. Refrigerate until set, about 30 minutes. 3. In a medium bowl, stir together the gelatin mix and boiling water. Mix in frozen strawberries, and stir until thawed. Pour over cream cheese mixture in pan. 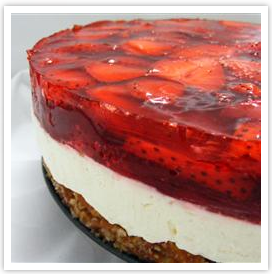 Refrigerate until completely chilled, at least 1 hour.